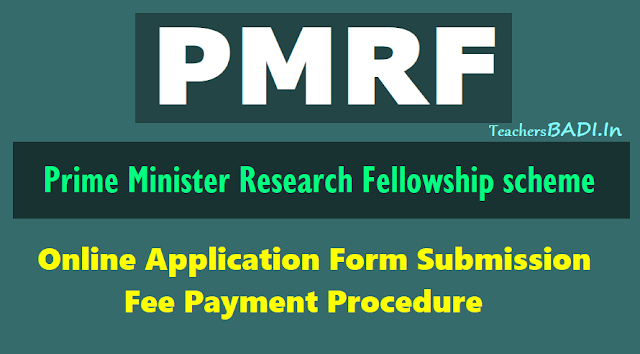 Prime Minister's Research Fellowship(PMRF) Online Application Form filling instructions, PMRF Application Fee payment instructions. Supporting Information for Online Application: Please read the supporting information carefully. The link for the online application form will be available at the bottom of this page from 10 am on 24 February 2018. In the online application form all fields and attachments are required except for the broad discipline and institute combination preferences fields. For the broad discipline and institute combination preferences fields at least one preference combination is required. For employment related details, additional information is required if applicable. Supporting Information for PMRF Online Application Form. Please read the supporting information carefully. The link for the online application form will be available from 10 am on 24 February 2018. There is an application fee of Rs 1000 for PMRF Online application form submission. The fee can be paid online to State Bank of India (SBI). Please click on the fee payment link, that will take you to the assigned SBI Collect page. You do not need to have an SBI account to pay the fees on the SBI Collect page. You will need to accept the terms and conditions to proceed. Please select Payment Category as ‘PMRF Application Fee 2018’ and complete the remaining steps to make the payment. You get an online e-receipt as a pdf file, please save it. You will will get an SBIcollect reference number, please note it. You will need to upload the e-receipt file in the application form. You will also need to enter the SBIcollect reference number in the designated field in the application form. Please fill in your complete name same as it appears in the official record. Please make sure that you are filling in your correct date of birth, as it appears in the official record. The address for correspondence should be your permanent address, it is where the final offer letter to the selected applicant will be sent. You have an option to save an incomplete application and resume working on it later at the end of the form. Frequently save your application. Please save as often as you need to. You can only start saving the form once you have entered your email ID and confirmed it. When you save the application for the first time, you will receive an email with a system generated password that should be changed using the link provided in the email. If you do not receive an e-mail after saving or submitting, please check your spam folder. Correct Aadhaar number is essential for establishing the identity of the applicant at a later stage. For students from Assam, J & K and Meghalaya passport number, ration card number, driving license number is also valid. The uploaded photograph should be recent and should not be older than six months. The institute field in the Academic Details of Qualifying Degree section requires the name of the institute where you have received or are pursuing qualifying degree. The qualifying degree (i.e., four year undergraduate or five year integrated M.Tech or five year integrated M.Sc. or five year undergraduate-postgraduate dual degree program in a Science and Technology stream) must be from an IISc/IIT/NIT/IISER or a centrally funded IIIT. The abstract should be original in applicant’s own words and should limit to 1000 words. The abstract should have applicant's name on the top. The Project abstract should clearly articulate the area of the study and should evidence interest and insights for the subject chosen. The Project abstract should formulate a problem for study. This will be used for assessing the applicant's analytical and research skills. The referees are whom the applicant has closely interacted with during his undergraduate or postgraduate program and who can comment on the applicant’s educational capabilities and research and analytical skills. An applicant can fill maximum 24 (doublets) combinations of broad disciplines and institutions. When a broad discipline is chosen the respective institutes that are offering the PhD program in that discipline will appear in the “Institute options field”. An applicant can opt for one or more discipline as well as one or more institutions. The CV should be limited to Two A4 pages and submitted only in pdf format. The CV should emphasise only on academic achievements and skills, e.g. ranks, merit certificates, internships, publication, research related software skills.